The RCVS is based at Belgravia House in the heart of Westminster, only minutes away from the Houses of Parliament. If you are planning to stay overnight, you can download a list of nearby hotels from the 'Related documents' box below. View where we are on Google Maps. 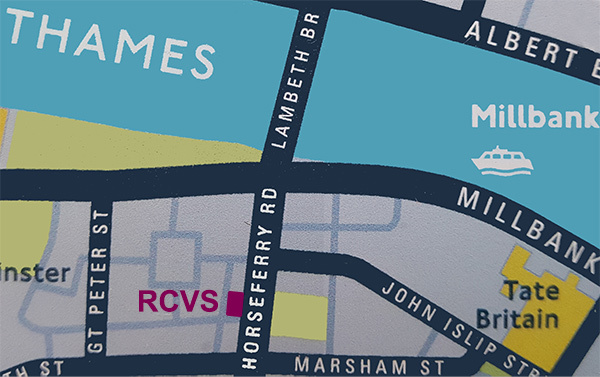 If visiting us by car, please note that the College falls within the congestion charge zone and you will be charged £11.50 to enter central London during the week between 7am and 6pm. There are two-hour and four-hour parking bays available outside Belgravia House. APCOA car park is about 5 minutes walk from Belgravia House. It is located in Arneway Street, SW1P 2TX. Q-Park Westminster car park is about 10 minutes walk, in Great College Street, SW1P 3RX.